Eggplant with tomato and basil are a classic combination. At La Tavernetta the eggplant was cooked in charcoal, which gave it a nice smoky twist, and the tomato was cooked slowly to intensify its flavor. 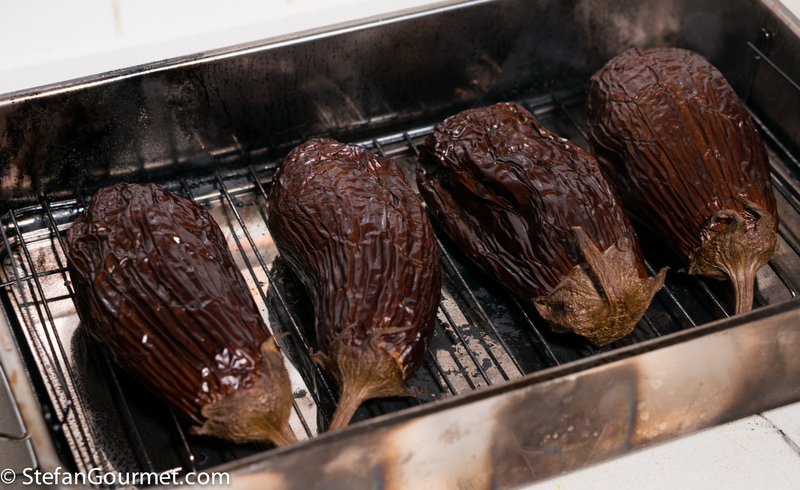 As I didn’t feel like tending a charcoal fire for an hour, I decided to precook the eggplant in a regular oven and then finished cooking it in my tabletop smoker. This provides an intense smoky flavor, that works very well with the creamy buffalo mozzarella and sweet and tart tomato. You could of course also cook the eggplant completely in a charcoal-fired grill with a lid, and skip precooking in the oven. This is great as a starter or as a vegetarian main course. Note: in the photo you see 4 eggplants; I realized after smoking the eggplants that the proportions were off. I will show you in my next post what I did with the leftover smoked eggplant. 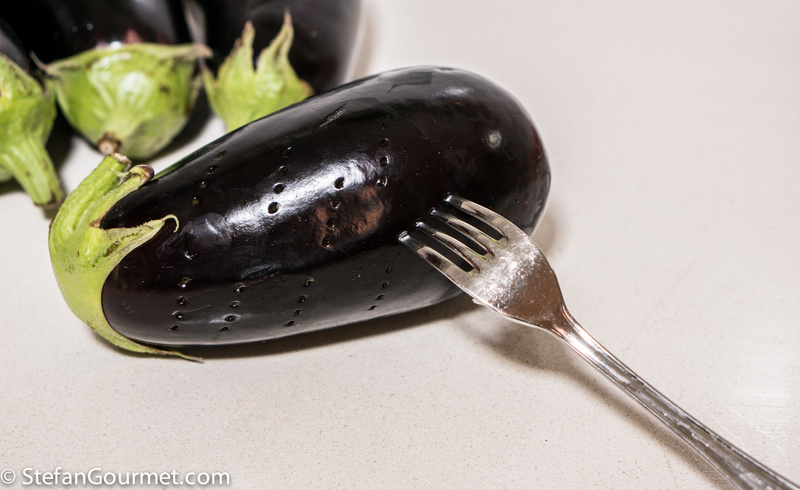 Pierce the eggplant all over with a fork. 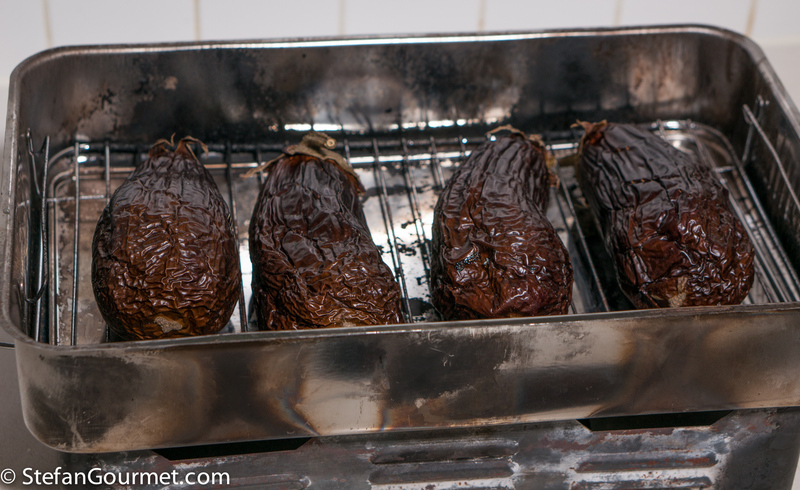 If precooking and finishing in a tabletop smoker, preheat the oven to 180C/350F, and cook the eggplant for 45 minutes at 180C/350F. Otherwise, cook the eggplant with indirect heat on a charcoal-fired grill with a lid until tender, about 1 hour. Allow the buffalo mozzarella to come to room temperature while you are preparing the eggplant and tomatoes. 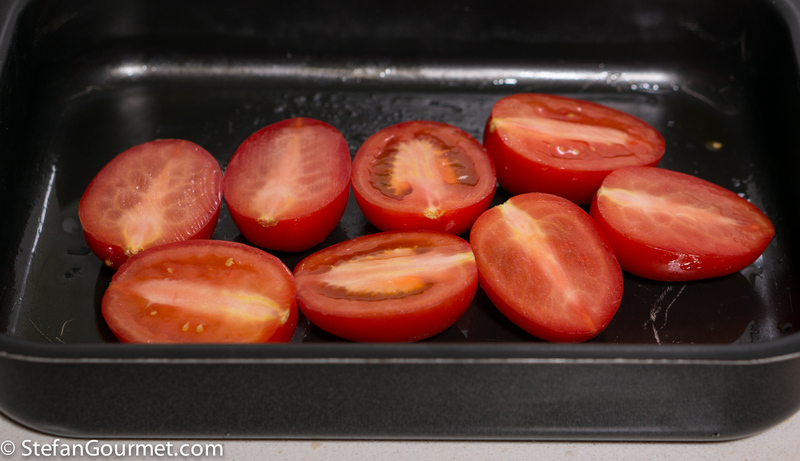 …until the tomatoes are browned but not burnt. …for 10 to 20 minutes, depending on how smoky you like the eggplant to be. I did them for 20 minutes and they were very smoky. 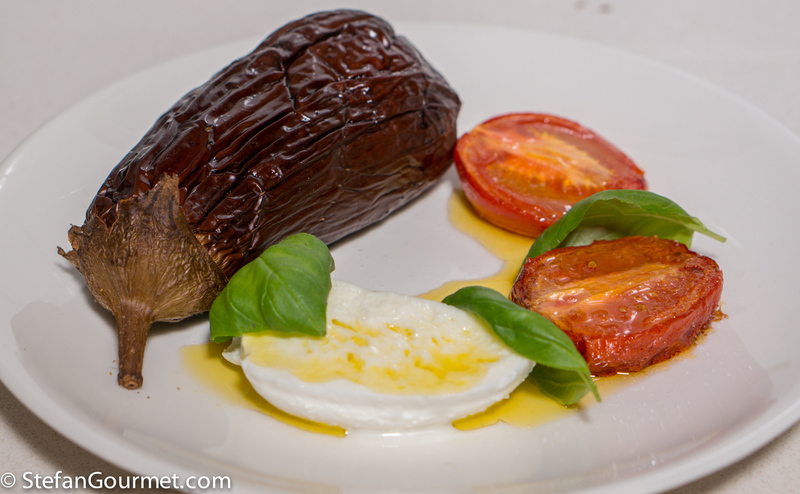 Arrange the smoked eggplant on a plate with the roasted tomatoes, buffalo mozzarella, and basil. 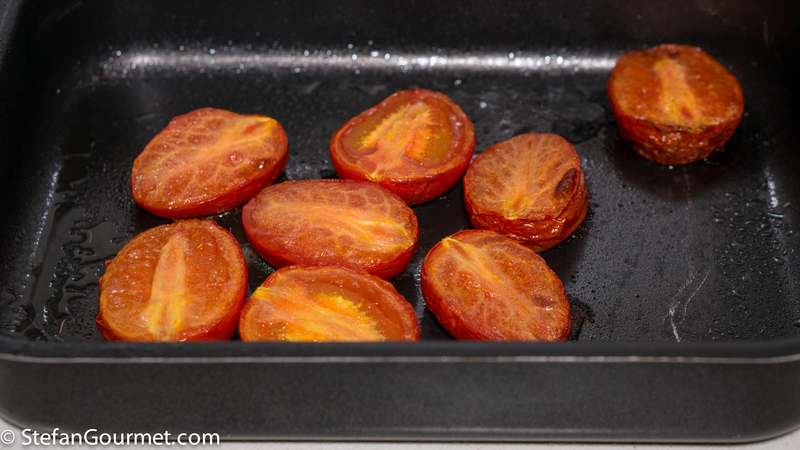 Season the mozzarella and tomatoes with salt, and drizzle with the best extra virgin olive oil you can afford. (If it is not fragrant, buy a better one!) Serve when the eggplant and tomatoes have cooled down a little (but are still warm). This is great with rosé, especially if you can find an oaked one (as oaky wines go well with smoked foods, generally speaking). An oaked white would work as well. Lamb shank is one of my favorite cuts of meat, especially when cooked sous-vide. It is so flavorful, tender, and moist. 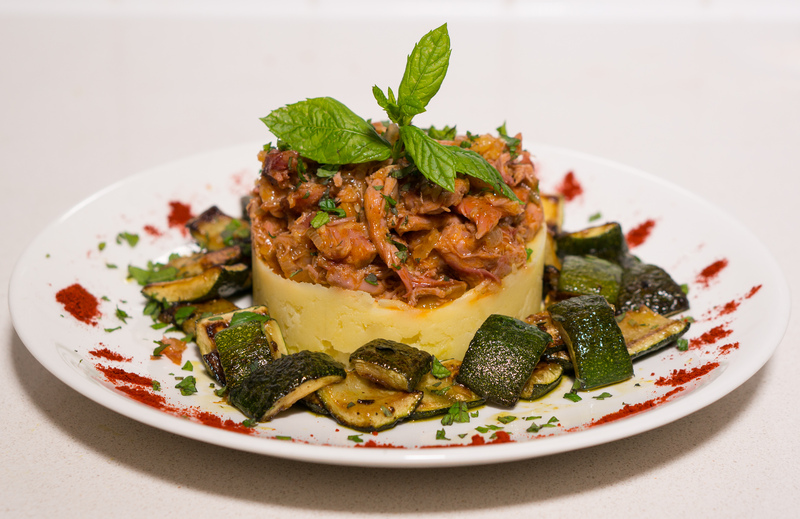 In this case lamb shank is paired with smoked paprika and zucchini. I used the soft inner part of the zucchini for the sauce, and sautéed the rest. With a bit of fresh mint and mashed potatoes a delicious meal was put on the table. And it was very nice indeed. The lamb married very well with the smoked paprika, and the sautéed zucchini provided a nice crunchy contrast with the velvety lamb. As I have no smoking facilities in my current kitchen setup : that being the primary aim in this very simple but no doubt flavoursome offering . . . shall file and take along to friends with smokers avec the few ingredients needed . . . where there is a will there is a way . . . So simple, but it seems so good as well.